RPSC RAS RTS Result 2018: The Rajasthan Public Service Commission is going to declare the RAS RTS Results on its official website by this week, as per reports. Candidates are advised to keep track of their result on the official website rpsc.rajasthan.gov.in and download the same as soon as it is out. RPSC RAS RTS Result 2018: Rajasthan Public Service Commission (RPSC) is reportedly going to declare the results of Rajasthan Administrative Services (RAS) and Rajasthan Taxation Service (RTS) preliminary combined competitive examination by the end of this week. 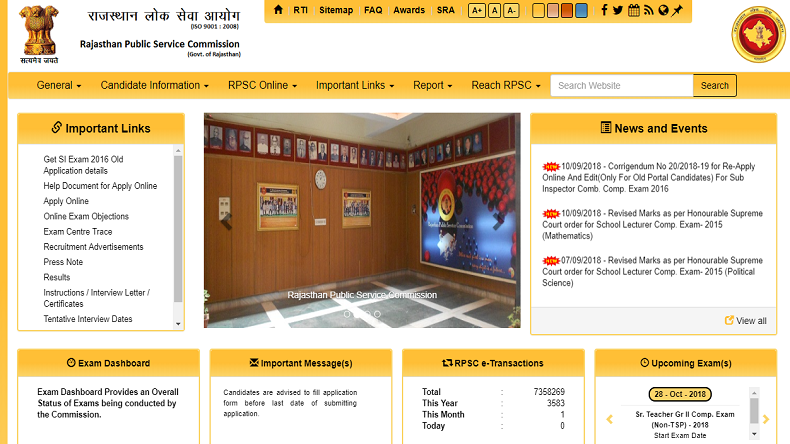 Candidates who have appeared for the examination can log into the official website of RPSC, i.e. on rpsc.rajasthan.gov.in and check their respective results. Moreover, the answer keys of the RAS, RTS examination were released on August 9, 2018. Reports say that the RPSC RTS and RAS examinations were conducted by the commission in the month of August at various centres across the state of Rajasthan. The candidates will be selected for the positions on basis of their performance in the written examinations and PI to be held after the declaration of the results. Reports say that more than 4 lakh candidates registered themselves for the RPSC examination but only 3.76 lakh candidates appeared for the same this year.